The morning started as usual in our beautiful hotel and after breakfast the team headed to the Faith and Love-Orphange — or Marlaine’s place as we call it, because she is the wonderful, inspiring person who runs this home for over 70 orphans, from babies to grown ups. We were welcomed very sweet and warm as always. She told us that she never feels alone anymore since we all came into their lives. 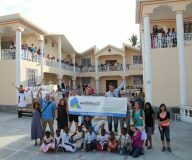 And that we are not just visitors,we are family and will always have a home there whenever we are in Haiti. The group got split into two and a few went over to the Espoir des Enfants Orphanage run by a great guy called Jacques, I stayed with the bigger group at Faith and Love and we helped painting in the new house part which is the home for all the girls.The new extension of the orphanage has been made possible because of all our wonderful donors and supporters and we are very happy and thankful about this. While painting, I suddenly heard a woman singing outside the orphanage. She was doing the laundry for all the kids (and it’s not as easy as we are used to — it was all hand washing) and singing a song in her mother tongue, which was beautiful to listen to. 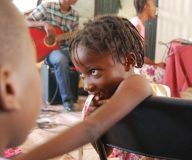 Then, when I took a little break, I found Jason Manns, who is a wonderful enrichment for the trip, teaching some older kids how to play guitar and later they sang and played together. The kids love him and his guitar and so do we! Later we headed to a beautiful place over the ocean for an amazing birthday lunch. Cyril, our tour guide, did everything to make it a special birthday for me. We had drinks, and even if it is not usual to have dessert in Haiti, we had cake and then the band played the happy birthday song for me. This is our last evening in Jacmel. Tomorrow we head back to Port au Prince. I can’t express in words how wonderful, touched and blessed I feel about all the experiences I have had during these three years, all the love I spread and received and all the beautiful smiles I saw. Not to forget all the wonderful support of my donors. Hope 2 Haiti may come to an end, now that the Jacmel Children Center is finished, but the bonds we created, the love we shared will be in our hearts for the rest of our lives. Haiti and its people are beautiful and I own them so much.